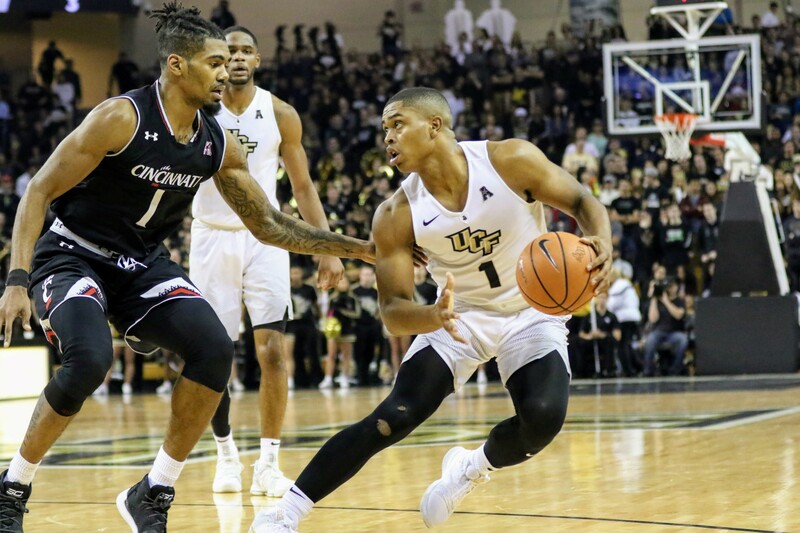 The offensive struggles continued Tuesday evening for Johnny Dawkins’ squad as UCF (12-6) fell behind late, losing at home 49-38 to the No. 11 Cincinnati Bearcats. In his first game back since suffering a foot injury at the start of the season, B.J. Taylor finished the night with six points and one assist in 21 minutes off the bench. The junior guard played under restricted minutes after coming off the bench for freshman guard Terrell Allen, who has started in his real. UCF jumped out to a 14-5 lead early in the first half despite shooting 22.6 percent in the half and led 19-15 at halftime. In the second half, however, the Bearcats came out to play, outscoring the Knights 34-19 in the second half. With 6:03 remaining in the game, Tacko Fall made a layup and pulled the Knights within three. Four minutes later, UCF found themselves trailing by nine. Defensively, the Bearcats forced 14 turnovers while holding the Knights to 30 percent shooting. No UCF player scored more than seven points while Fall, Allen and Dayon Griffin had seven apiece. Gary Clark scored 17 points and grabbed 15 rebounds for the Bearcats and affected both sides of the ball. Clark scored a layup at the 13:40 mark of the second half which was the start of a 10-2 run giving Cincinnati a 38-30 lead. Cincinnati never looked back. UCF travels west Saturday to face USF in the War On I4.